Next Saturday at 7:55 p.m. local time [MDST] as part of the annual pilgrimage of the Sun, He will pass over the equator on His southward journey, marking the fall equinox, and announcing His entrance into the sign of Libra. This equinoctial colure divides the months of summer’s light from the months of winter’s darkness. Over the next three months leading up to the Winter Solstice the days will get progressively shorter and the nights will get longer. Day and night are culturally powerful symbols which have been used throughout history to represent the forces of good and evil. The Scales of Libra holds these forces in equilibrium. In English and Spanish, we use the word Libra which originates in the Latin word of measurement for pound. To this day we abbreviate pound as Lb. short for Libra. In French the zodiacal sign of Libra is called le balance, in Portuguese, balança and in Italian bilancia, all which derive from bi-lanx, the Latin word for scales — meaning two pans. 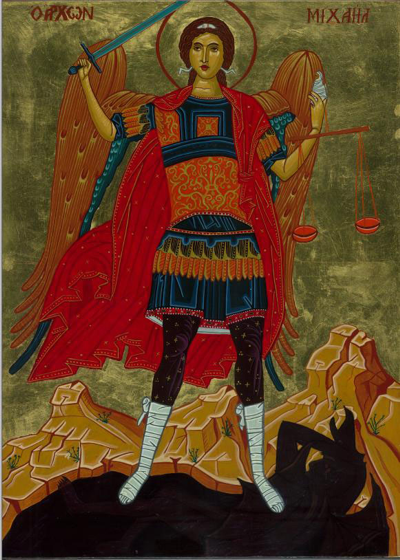 St. Michael the Archangel poised with sword raised in one hand, partitioning the light half of the year from the dark half, ready to battle the forces of darkness while holding the scales of balance in the other. What is balance? The dictionary tells us that balance can be either a noun or a verb. As a noun, a balance is the previously described instrument of determining weight, typically with the equilibrium of a bar with a fulcrum at the center from which at either end is suspended a pan. One pan holds the object to be weighed, while the other contains an object of known weight, often made from stone or metal. Scales were developed early in human culture from that deep-seated desire to strike a fair deal, be it in wool or walnuts. Examples of scales that were designed in a form still recognizable today and dating back to over 2,000 B.C.E., have been excavated in Egypt and Pakistan. 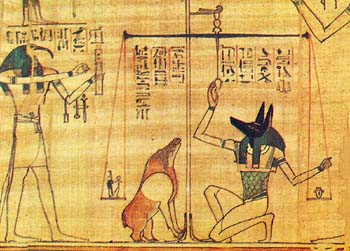 It was not uncommon for the Egyptian gods and goddesses of the afterlife to be depicted holding scales. 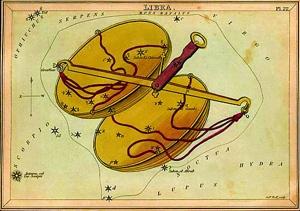 Over time Libra, the symbol of the scales or balance, also became the symbol for the courts of law. As a verb, balance can mean to hold an object in equilibrium or poise, such as balancing a cup of water on one’s head. For the artist, balance can mean arranging the proportions of something to make it symmetrical. In accounting we can balance an account, and if we’re lucky, we can balance our own checkbook. The Greek word for “life” or “animal” is Zoë. Our word zoo, the place where we collect and display animals, has its etymological origins in this source. Thus, the word zodiac literally refers to the band of life and is pictured by a band of animals. Curiously, Libra, is the only inanimate object among this band of animals. Perhaps this was to extricate it from the realm of the human, to make justice impartial and a mechanism of the Divine. Balance is also important to our experience of being human. Homeostasis is the physiological process by which our bodies perpetually adjust to maintain an internal state of equilibrium. The body’s self-regulating tendency towards balance is optimal for health, vitality and our physical survival. In matters of health we are continually reminded that our well-being is dependent upon eating a balanced diet or having a balance of rest and activity. Ancient health systems such as those of Hippocrates, Galen, Ayurveda, and acupuncture are all focused around bringing the body back into harmony. Mental health is not just freedom from mental illnesses, it is another name for mental equilibrium. Mental health is the ability to balance ourselves in constantly changing life circumstances, the ability to cope with stress, and to enjoy life. It is the role of mental health practitioners to assist individuals experiencing imbalanced minds to achieve a state of mental equilibrium. We all know that there are certain persons in this world who are hard-wired to step outside their individual needs and who effort tirelessly for peace, justice, equality, and the well-being of others. Over the last two hundred years our greatest social advances have been made by persons courageous enough to go against the trends of the dominant culture. These men and women of conscience have advocated for the abolition of slavery, women’s rights, the protection of helpless children or seniors, the humane treatment of animals, worker’s rights, racial equality, or the rights of the LGBT community for equal protection in marriage. In these same two centuries the world has been rocked by violent revolutions and counter-revolutions in places that include, but are not limited to the United States, France, Mexico, Russia, China, Vietnam, El Salvador, Chile, South Africa, and more recently, North Africa and the Near East. For the most part, these uprisings have been vehement efforts on the part of the masses to transform the social structures that have allowed the privileged classes to abuse the underprivileged classes. These civil conflicts have enjoyed partial successes, but often at the cost of torture, hardship, the destruction of the environment and the loss of human life. One man’s terrorist, always turns out to be another man’s freedom-fighter. During this era, courageous men and women such as Henry David Thoreau, Leo Tolstoy, Mahatma Gandhi, Dorothy Day, Rev. Martin Luther King Jr., César Chavez, Mother Theresa, Nelson Mandela and Rigoberta Menchú have sought to restore balance to society through non-violent reforms. Early human civilizations developed laws and civil codes of justice to maintain peace and order among community members. One of the oldest codes of law was that of Ur-Nammu, written in the Sumerian language around 2100 years BCE. 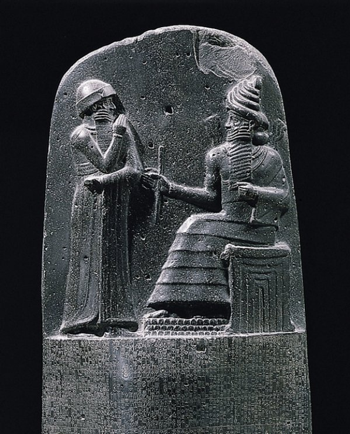 Perhaps, better known, is Hammurabi’s Code which was written in Akkadian on a stone stela that dates to about 1754 BCE. In India, the Manusmriti, or Laws of Manu, were inscribed in Sanskrit around 200 BCE. Of undetermined age is the Jewish Halakha, with 613 Mitzvoth or commandments. And more familiar to our own modern culture is the Codex Justinianus, the guiding laws of the Byzantine Empire in the 6th Century CE. All these early written codifications, no doubt stem from even earlier oral traditions - all designed to uphold peace and justice within communities. However, in the primeval “eye for an eye” world, just punishment in some cases might include financial restitution, maiming or even death. From the examples we can deduce that somewhere within the human psyche or soul lies a desire for peace and justice even though it may not be evenly distributed amongst all individuals. In the ancient science of astrology, the archetype for this longing for equality was placed among the constellations as Libra and pictured as a Balance or Scales. I have already described Libra, as the sign of peace and justice. We are inclined to forget that Libra is also the sign that rules open enemies, competitors, adversaries, and war. Without adversaries and war — where is the need for peace, justice and mediation? Like light and dark, war and peace are both kept in the delicate balance of Libra’s scales, reminding us that for every action there is a reaction. The Autumnal equinox and the month to come is a good time to take assessment of our lives. Each one of us must effort towards the realization of Peace and Justice. As we as individuals become fairer and more just, the world around us will become fairer, and more just. Those “little bits of good” will add up and overwhelm the world.